There was a Delphi for Android 2013 contest in Russia and the winner of the contest was a game called TapTap. Source code for the game is available for Delphi XE5 Firemonkey and there are multiple blog posts with interviews with the creator of the game (Nikolay Zverev). 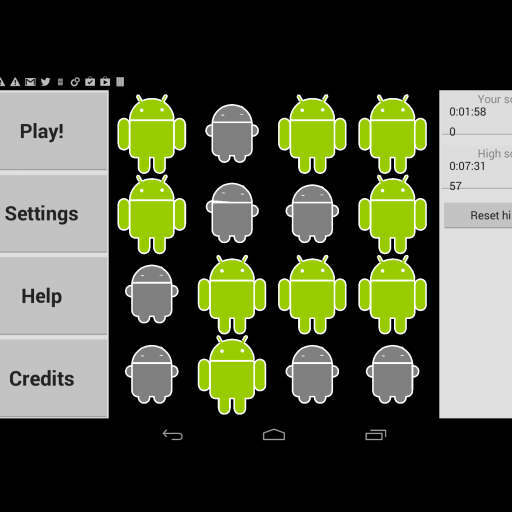 The game consists of a 4×4 icon grid and the goal is to switch all of the icons to the green Android character. Each icon you click however switches every icon in a vertical and horizontal line from that line to the opposite icon. Frames were used in the creation of the game. Frames remind me of MovieClips from Adobe Flash. An APK and an EXE are also provided on the blog so you can play it on your device or on Windows as well. It should be pretty easy to make the game also run on IOS as I don’t see anything that is Android only. Head over and download the source code for the TapTap Delphi XE5 game.